At Heimtextil Frankfurt (8-11 January 2019), Trevira GmbH will be represented by 22 Trevira CS customers with an enlarged stand area. Compared with the previous year, this represents a considerable increase in stand space (2018: 1300 m², 2019: 2000 m²), as well as an increase in the number of participating Trevira customers (2018: 16). The entire textile value creation chain will be covered: from fibre fabrication and yarn manufacture to dyeing and further to panel production by weavers, warp knitters and knitters all the way to textile publishing. Customers will be exhibiting their Trevira CS collections for the areas of home textiles and furnishings at individual stands. Visitors will thus gain an insight into the complex manufacturing process of textiles. Trevira Managing Director Klaus Holz: "The extremely positive way in which the market responded to our joint stand at Heimtextil 2018 has confirmed us in continuing to pursue this concept in 2019 and extending it even further. We are delighted to be able to present ourselves at this year's fair with even more Trevira CS top customers and, together with them, to cover the entire textile value creation chain". At the Trevira joint stand, which is located in the immediate vicinity of the exhibition "Interior.Architecture.Hospitality. EXPO" of Messe Frankfurt, there will also be a trend area for the contract market. Here, interior designers, designers and outfitters can find information about textile trends and colour trends in the home textiles and property sectors. Idea, concept, themes and colours were developed by the trend agency stilbüro bora.herke.palmisano from Frankfurt. A top-class trend panel consisting of Sebastian Herkner/Studio Sebastian Herkner Offenbach, Markus Hilzinger/FINE ROOMS Berlin, Corinna Kretschmar-Joehnk/JOI Design Hamburg, and Sylvia Leydecker/100 % interior Cologne provided ideas and contributions to the areas of product development, hotel & gastronomy, working environments and health & care. 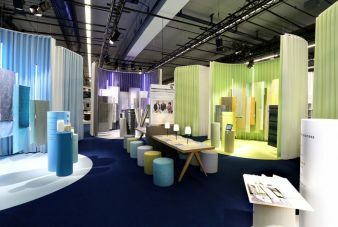 Marketing Director Anke Vollenbröker: "We are delighted to be able to offer trade fair visitors a special highlight with our new 'Trends in Contract by Trevira CS' exhibition. At our trend area, we will convincingly demonstrate that with the variety of highly topical Trevira CS fabrics, sophisticated trend statements for the property market can be realised. The jury was particularly impressed by the degree of innovation of the yarns made from flame retardant Trevira fibres and filaments". The following customers will be exhibiting at the joint stand: Engelbert E. Stieger, FIDIVI Tessitura Vergnano, Colsman brothers, Wylach brothers, Georg and Otto Friedrich, Gerriets, Hoftex, JAB Anstoetz, Jenny Fabrics, Lonfil, Mattes & Ammann, Mottura, Pugi, Spandauer Velours, SR Webatex with Getzner Textil, Swisstulle, Tessitura Mario Ghioldi, GTorcitura Fibre Sintetiche, Torcitura Lei Tsu with Ilcat, VLNAP, Wagenfelder Spinnereien, and Wintex.